Welcome! I’m excited to have been invited to join the Spinzilla blog tour. The purpose behind the Spinzilla competition during Spinning and Weaving Week, Oct 6‒12, is not only to learn more about handspinning, but to learn more by doing. When it comes to craft, theory is only truly useful when applied—when skills are honed through practice. Spinzilla urges us to make more time in our busy schedules to grab our spindles or sit down to our wheels and get spinning. Much of the way I approach textiles is framed by my background in agronomy. 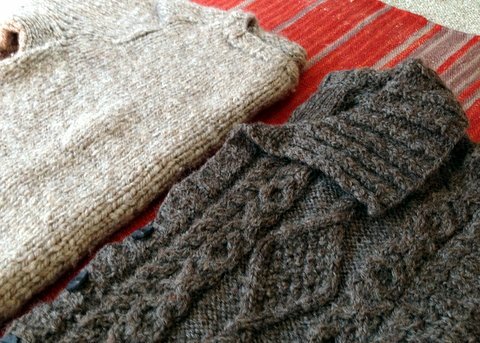 I studied soil chemistry at university, and while it might not seem that clay minerals have much to do with handspun sweaters, the spirit of their study is similar. We can take the measure of a soil in many ways: by studying the available nutrients, digging a hole and looking at how the soil formed in pre-history, and on and on. We can’t be certain how the soil will change over time due to the action of weather, soil organisms, and other factors, but our measurements can allow us to make some assumptions and educated guesses about what the future will hold. Textiles are the very same. Planning and creating a textile is a blend of science and art and educated guesses. 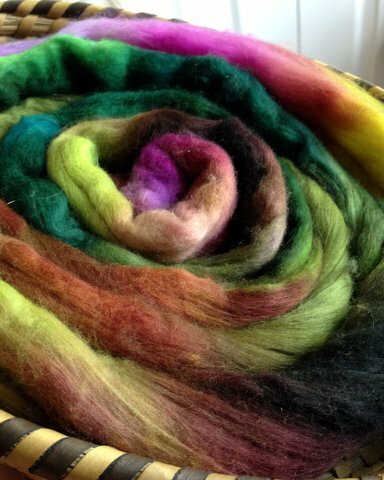 As we all start gathering fiber and planning projects for Spinzilla, you might be asking how much fiber you need to stockpile for certain projects. When we are new to spinning and ask more experienced handspinners this kind of question, we usually receive the oft uttered “It depends…” response. And it does. There isn’t a short answer, and I can’t show you a chart that will tell you exactly how many ounces of fiber you will need to knit a sweater. Why? Because there are so many variables, not the least of which is the differences in our unique handspun yarns. A skein is the product of our fiber, our wheel, our technique—and sometimes our mood! The more experienced we become, the more subtle the changes and the more control we have over them. But we leave our own unique fingerprint on the yarns we create, and we can find a bit of ourselves in their texture. Two sweaters spun from Sheep Street Fibers shetland roving. Sweater on left is my first handknitted sweater, worsted spun and weighing nearly two pounds. I spun and knit the sweater on right years later using a woolen draw—it weighs about one pound. I can’t answer your query, “How much fiber do I need?”—but you can. (b) how many yards of finished yarn can be spun from the fiber you would like to use. 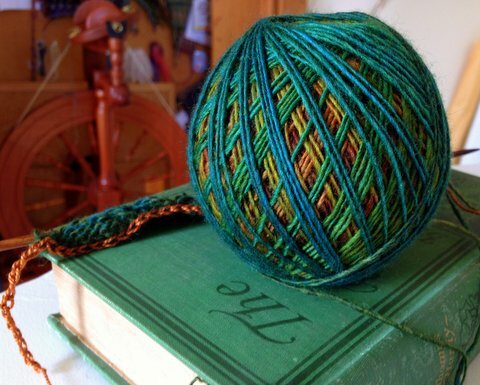 If you have already picked a project to spin for, you likely know how many yards you need. For knit and crochet, check out the yardage requirements for similar projects. (Ravelry is great for this.) If you are weaving, most beginning weaving books will offer guidance on calculating yardage, as does Alden Amos in the Big Book of Handspinning on pg. 249. The second thing we need to know is yards per pound, which is also called grist or simply YPP. For a given fiber, the YPP for a finer gauge yarn will be higher than that of a heavier gauge yarn. (You can get more yards from a merino top if you spin it laceweight rather than bulky, right?) The reason this measurement is so useful to us spinners is that it goes beyond gauge—it takes the density of a yarn into account as well. The denser the yarn, the fewer yards you will get from a pound of fiber. Many folks use a yarn balance to determine YPP. Merino dyed top from Abstract Fiber in Laurelhurst. Just this week I have been planning a handspun Among the Birches shawl. I started with a 4 ounce braid of merino top, and I wanted to find out if I had enough fiber to make a slightly narrower version of the shawl from fulled singles. I spun up several samples of singles and fulled them. I pulled out my yarn balance and snipped a handspun sample until the balance arm was level. Then I repeated this twice more. The more samples you do, the more accurate the reading. 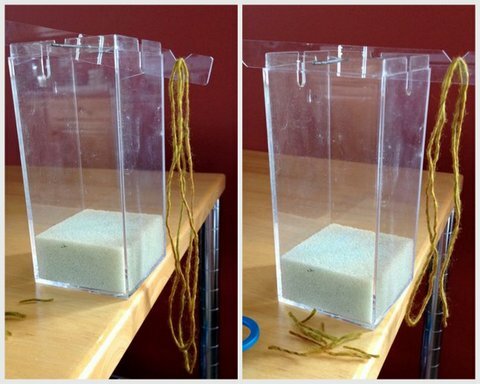 Lay a sample of yarn on the balance arm that is long enough that the arm is weighed down. Start snipping the sample until the balance arm is level. Now, you are ready to measure your samples. I measure the yarn completely lax and under some tension for two separate readings. This will give me a range of YPP to work with. 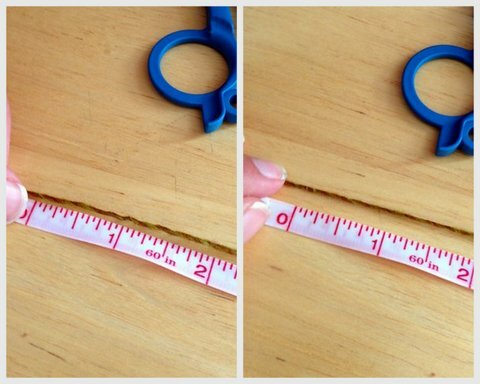 Without tension, this sample measured 26 inches, under tension it measured 27 inches. Multiply that value by 100 and I have a yardage range of 2,600 to 2,700 YPP. My 4 ounce top (a quarter pound) should give me about 650-675 yards based on my samples. The pattern calls for 900, so I should have enough for a scarf version. Off I go! It’s also important to remember that our measurements are only as exact as our testing samples and tools. What’s a spinner to do? Practice, of course. The more yards that pass through your fingertips, the more adept you will be at understanding small differences in your yarns. And in turn, you will be more comfortable with the fine art of the educated guess. So, go forth and spin! 7/8 Team Spinzilla—Why Make Yarn At All The Blog Tour Kick Off! 8/5 Kate Larson—How Much Fiber Do I Need? Over 50 teams are participating in the Spinzilla competition this year and team member registration is now open. Team spinners can sign up for their favorite team until Sept 22, and rogue spinners can sign up until Oct 3. See the Spinzilla website to register. In 2013, over 600 spinners competed on 27 teams and as individual rogue spinners. They collectively spun nearly 1.4 million yards of yarn. Come join the fun! So if you were planning on a 2-ply yarn you would need twice as much? also, I thought a yarn balance device is for measuring the yards in a pound of yarn,. I still am not sure how that translates into the amount of fiber needed to spin a pound of yarn. Do you do some samples where you weigh small amounts of fiber and then see how much length of yarn you spin from it and estimate from that? If you were planning a two-ply yarn, you would start with a sample of two-ply rather than singles. So, you would pop a sample of finished two-ply onto the balance and snip until the arm was level. Take the piece that remains off of the balance and measure it with a ruler. Each inch is equal to 100 yd/lb. So, if you have a 10 inch sample, it is about 1000 yd/lb. To answer your second question, let’s say you are planning a sweater that calls for 1500 yd. To make the sweater out of the fiber you sampled in a two-ply yarn, you would need 1.5 pounds (24 ounces). If it was me, I would spin a bit extra, too! Yes, a yarn balance measures the yards in a pound of yarn, and a pound of fiber will make a pound of yarn. aha, that’s what I was looking for when you wrote “a pound of fiber will make a pound of yarn”! thanks. This is great info. I like knowing how many yards I will get after spinning a sample for my given fiber purchase. My favorite purchase was my yarn balance you told me about several years ago. I rely as much on it for spinning as my knitters gauge for knitting. Thanks, Amy! I hope you are well! This is very helpful! Is it available, or will it be available anywhere in print (or printable, PDF) form? Hi Jamie! I’m glad that you found this useful. You can print the webpages from your browser. I already have the post in a PDF file and will email you a copy. Thanks for the clear, concise and practical information! Thanks, Amanda! I hope it’s helpful to you.